A career-spanning collection of the writer’s celebrity interviews. Since 1987, George Wayne, or GW, has picked the brains of pop-culture luminaries for readers of his DIY magazine R.O.M.E., Interview, and Vanity Fair, where his column appeared for 22 years. Collected in this volume for the first time, the interviews offer unique insight into a particular New York social circle populated by the glitterati, fashionistas, celebrities, and other socialites. Having landed in New York in the early 1980s after graduating from the University of Georgia, Wayne immediately immersed himself in downtown clubs, and his predilection for fashion designers and celebrities reflects the exclusivity and stratification of that scene. (References to air-kisses abound.) The “Q&As,” as the author calls them, are conversational and irreverent, and Wayne never shies away from asking controversial, occasionally random questions. He asks Joan Rivers about her fondness for plastic surgery, 90-year-old architect Philip Johnson about Viagra, and on which date David Copperfield first slept with supermodel girlfriend Claudia Schiffer, among other non sequiturs. Updated with contemporary introductions, not all of Wayne’s interviews seem slated for posterity. His fawning adoration of “alpha fox” Ivanka Trump and the assurance that she would “keep POTUS 45 [her father, Donald Trump] grounded and real” is already terribly dated. Other interviewees include model Kate Moss, Donatella Versace, Carrie Fisher, Marc Jacobs, Barry White, Kathleen Turner, Farrah Fawcett, Tony Curtis, Charlton Heston, Martha Stewart, and Russell Simmons. Featuring a foreword by Vanity Fair editor Graydon Carter (who says Wayne reminds us “that we could all use a bit more mischief in our lives before the age of the individual passes us by for good”), Wayne’s collected interviews are playful snapshots of the rarefied world of celebrity shoulder-rubbing. 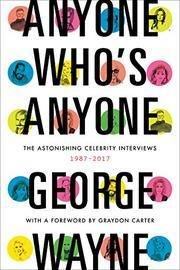 At times fascinating, the interviews offer a casual, unguarded look at some of the most high-profile personalities of the past 30 years.